7 LA RAZA NATIONAL LAW STUDENT ASSOCIATION On March 28, 29 and 30th- La Raza National Law Student Association held its annual convention at Arizona State University, Tempe Arizona. Delegates from 28 Law School Chapters attended. Five Midwestern schools, University of Kansas, Wisconsin, De Paul, Marquette and U. of Iowa, elected Paul Serrano of Kansas to the National Board. La Raza Students elected Eddie Benavidez, a student at American University, Washington D.C., as National president. Mr. Benavidez was last year's national vice-president. By unanimous vote the convention voted to contact Bean Robert Bodean, Marquette university Law School, to question the law school's policy toward Chicano students. Two Marquette students addressed the delegates pointing out their grievancesagainst the university. 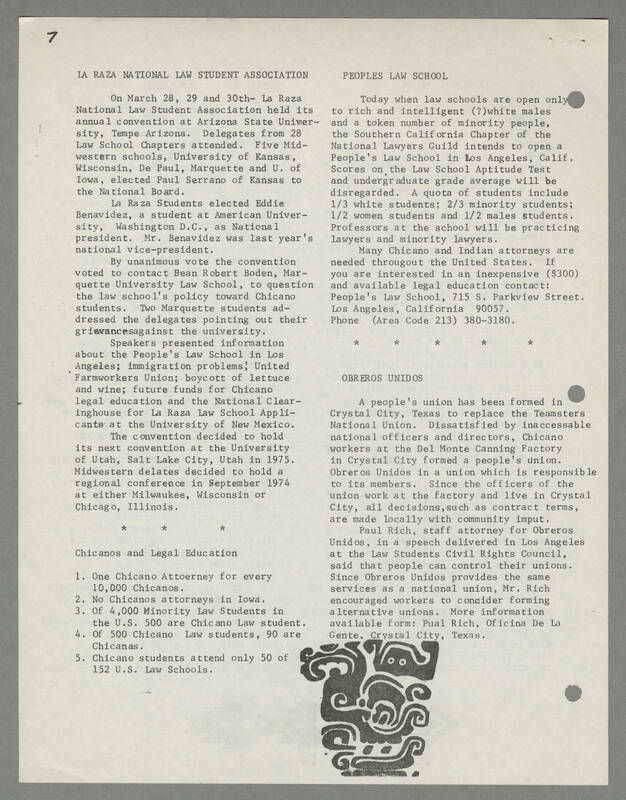 Speakers presented information about the People's Law School in Los Angeles; immigration problems; United Farmworkers Union; boycott of lettuce and wine; future funds for Chicano legal education and the National Clearinghouse for La Raza Law School Applicants at the University of New Mexico. The convention decided to hold its next convention at the University of Utah, Salt Lake City, Utah in 1975. Midwestern delates decided to hold a regional conference in September 1974 at either Milwaukee, Wisconsin or Chicago, Illinois. * * * Chicanos and Legal Education 1. One Chicano Attoerney for every 10,000 Chicanos. 2. No Chicanos attorneys in Iowa. 3. Of 4,000 Minority Law Students in the U.S. 500 are Chicano Law student. 4. Of 500 Chicano Law students, 90 are Chicanas. 5. Chicano students attend only 50 of 152 U.S. Law Schools. PEOPLES LAW SCHOOL Today when law schools are open only to rich and intelligent (? )white males and a token number of minority people, the Southern California Chapter of the National Lawyers Guild intends to open a People's Law School in Los Angeles, Calif. Scores on the Law School Aptitude Test and undergraduate grade average will be disregarded. A quota of students include 1/3 white students; 2/3 minority students; 1/2 women students and 1/2 male students. Professors at the school will be practicing lawyers and minority lawyers. Many Chicano and Indian attorneys are needed throughout the United States. If you are interested in an inexpensive ($300) and available legal education contact: People's Law School, 715 S. Parkview Street. Lost Angeles California 90057 Phone (Area Code 213) 380-3180. * * * * * OBREROS UNIDOS A people's union has been formed in Crystal City, Texas to replace the Teamsters National union. Dissatisfied by inaccessable national officers and directors, Chicano workers at the Del Monte Canning Factory in Crystal City formed a people's union. Obreros Unidos in a union which is responsible to its members. Since the officers of the union work at the factory and live in Crystal City, all decisions, such as contract terms, are made locally with community imput. Paul Rich, staff attorney for Obreros Unidos, in a speech delivered in Los Angeles at the Law Students Civil Rights Council, said that people can control their unions. Since Obreros Unidos provides the same services as a national union, Mr. Rich encouraged workers to concider forming alternative unions. more information available form: Pual Rich, Oficina De La Gente, Crystal City, Texas.